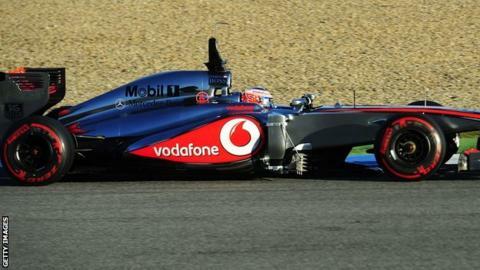 Blue skies and sunshine welcomed the Formula 1 teams to the start of pre-season testing at the Jerez circuit in southern Spain on Tuesday. The teams were beginning the work that will establish whether the ideas developed throughout last year and in the build of their new designs will actually bear fruit. Among the novelties, the biggest is Lewis Hamilton having his first test for his new Mercedes team, driving an F1 car that is not a McLaren for the first time in his career. Instead he's having to adapt to all the different buttons and switches on the steering wheel of his new Mercedes, some of which he has already asked to be deleted. Hamilton is also learning subtle differences in the way language is used during radio communications at his new team and of course forging new relationships with those around him in the garage. Over lunch on Tuesday, Hamilton was engrossed in conversation with the team's non-executive chairman Niki Lauda, who was instrumental in persuading him to switch teams. But it was a frustrating first day of testing for Mercedes. Hamilton's team mate Nico Rosberg managed only 11 laps before the car stopped with a small electrical fire, which required overnight modifications. Hamilton's old team had their own dramas, too, with McLaren's Jenson Button becoming the first "retirement" of the season in the early stages of the day, because of a fuel pump failure. New team-mate Sergio Perez, Hamilton's replacement, was watching from the pit wall alongside his friend and manager, the former IndyCar star Adrian Fernandez, who is deeply impressed by what he sees at "Checo's" new home. Fernandez was not only a highly competitive driver, he also ran his own team and took pride in everything being neat and ordered. He could not have found a better example of those traits than at McLaren, and yet he also says the warmth with which Perez has been treated belies the team's cold image. Fernandez says Perez feels even more included than he did in the family atmosphere of the Sauber team. F1 is heading into the final season of a set of rules that were introduced in 2009, so there are now very few identifiable differences between the cars, despite the hours and hours of work done by engineers at their desks and in wind tunnels. That's because over time the engineers all tend to zero in on one best solution to the various problems raised by a set of regulations. For the remainder, there will be extended highlights on television and full live coverage on radio and online, including audio commentary. Sauber have raised a few eyebrows with a sidepod design that is narrower than the rest, reducing frontal area but also limiting the amount of cooling air that can pass over the radiators inside. Other teams are intrigued to see whether they will gain any advantage in speed and still be able to maintain temperatures at a sensible level in the hotter climes of Australia and Malaysia. All bar Marussia have gone for a high monocoque in front of the driver and a stepped nose, but the majority have filled the step with a "vanity panel", which is more pleasing to the eye. Caterham and Lotus have not done so and there is no doubt their cars still look a little ungainly as a result. Colour schemes have altered subtly but without any huge transformations - a brighter green on the Caterham, a more vivid red for Marussia, more grey on the Sauber and the black lower border on the Ferrari. There's no doubt that in terms of the appearance of Formula One, it will be 2014 and a radically different set of rules before there are real surprises. For once at an event where F1 cars are running, I don't have to spend all my time in a commentary box. BBC F1 technical analyst Gary Anderson and I watched at various points around the track on Tuesday, and while it's impossible to see which car is going to be a winner just from observing, certain aspects of the cars' behaviour are instructive. The Lotus looks nimble in the hands of Romain Grosjean, while the Red Bull of Mark Webber appeared to be running on a heavy fuel load in these early sessions, the car reacting more slowly on turn-in and acceleration than when light of fuel. The Toro Rosso of Daniel Ricciardo looked promising in the slower corners, as the back of the car looks responsive to his inputs, while Paul di Resta was silky smooth and consistent in the Force India. The car appears to turn in well, it rides over kerbs and bumps with minimal deflection and he set a competitive time with absolutely no drama. This circuit at Jerez is not typical of many current F1 tracks, and a car that is fast here may not necessarily be on the pace elsewhere, but it can still give clues. We came across 1982 world champion Keke Rosberg - Nico's father - watching from one of the final corners, and he wasn't too impressed with the Ferrari of Felipe Massa, and thought that Pastor Maldonado was a bit ragged while pushing hard. That made Gary and me smile, as the Finn was well known for his hard-charging technique. Maldonado's car is in fact the 2012 version with some updates, and Williams are the only team not to have unveiled their new car as yet. Perhaps this explains the Venezuelan's abandon - he may well feel a little less sense of responsibility than drivers who are out in the brand new cars, for which spare parts will be at a premium. The wailing sound of a lone V8 breaks the conversation as another car flashes by. This is the last season of these 2.4-litre V8 engines, and I almost want to close my eyes and mentally record the sound for posterity. This time next year, the V6 engines will have taken over, with a turbo charged whistle. Not better or worse, just different - but for now let's enjoy what we have. Testing continues, the sun is still shining, and the groundwork for a new season is being firmly laid.